Irvine Access Floors (Irvine) is a specialized organization that focuses on the distribution of a wide range of access floor products. We are a privately held company and are proud to be affiliated with Tate Access Floors. With a knowledgeable staff that is committed to serving your needs, Irvine’s teamwork and expertise are second to none. Our main office is located in Laurel, Maryland – in the heart of the largest access flooring market in the U.S. With over 65,000 square feet of warehouse space, Irvine inventories the largest variety of new Tate material and hard-to-find pre-owned material. 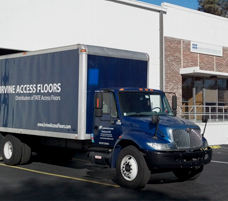 With offices and warehouse space in Maryland, Virginia, Georgia and Florida, Irvine is able to service the eastern states with ease and offer refurbished flooring to the entire United States.